This heavy duty metal hand pipe is big enough to be used for self defense as well as smoking. Plenty of storage space in the inside chambers. Free pipe screens included. Just like what I had when I was a teenager. This piece offers so much more than glass. Heavy duty, durable and damn well worth the money. The storage chamber is a damn good size for stashing too. Another great thing, you can alter the length and change the bowl if you choose. 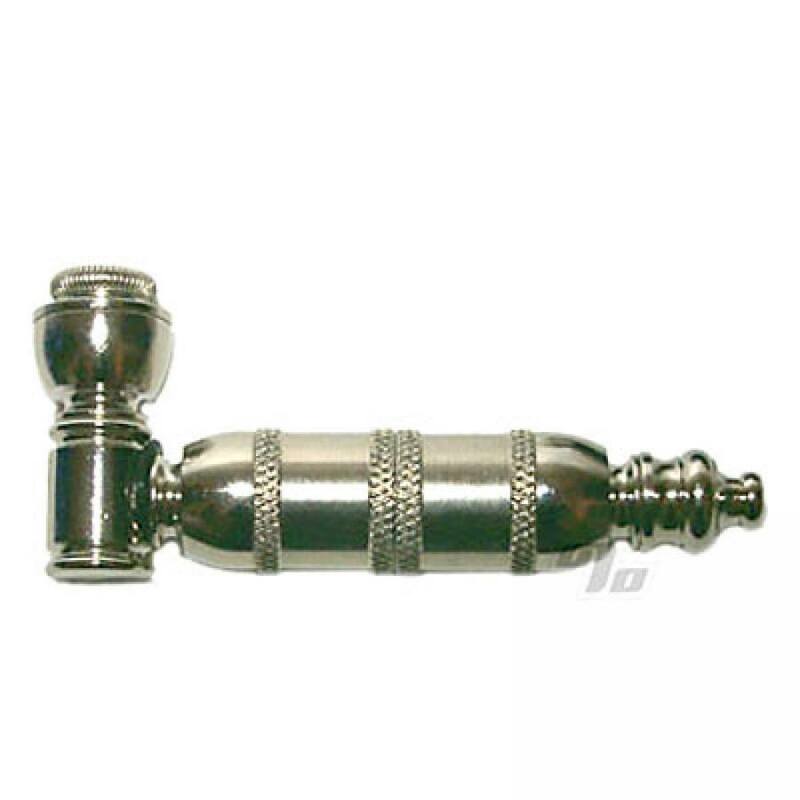 This is your basic pipe, but much sturdier than others. It has a larger bowl than some handpipes. It draws very well and cleans easily. And best of all, it doesn't tip over when you set it down! I think this will be my favorite pipe, and I've tried many kinds. Feels like an old classic. Size is just right and storing some in the middle chamber is convenient for travel. Doesn't get hot. I would buy again but I don't think I'll have to. This is a decent size, solid nickel pipe. Sharp looking and hits well. Has 3 different bowls in its assembly. If you are looking for a nice bowl, this is an excellent choice. Mighty pipe! Pretty large, solid feel and lots of chambers to fill some extra smoke. Smokes perfect! It does get hot when used too heavily but that's probably a benefit. Time to put it down and let it cool. The stash chamber is of generous size!